The Hamilton-Pence incident wasn't just a distraction. Anybody who walks through the doors of a theater should be prepared to have preconceptions challenged and beliefs questioned. And what more perfect summit for the two Americas to demonstrate that we can agree on absolutely nothing—not manners, not meanings, not even a working definition of “the two Americas”—than Hamilton? To recap: On Friday night, Vice President–elect Mike Pence and his family went to see Lin-Manuel Miranda’s Pulitzer- and Tony-winning musical (“which I hear is highly overrated”—Donald Trump, 11/20/16). 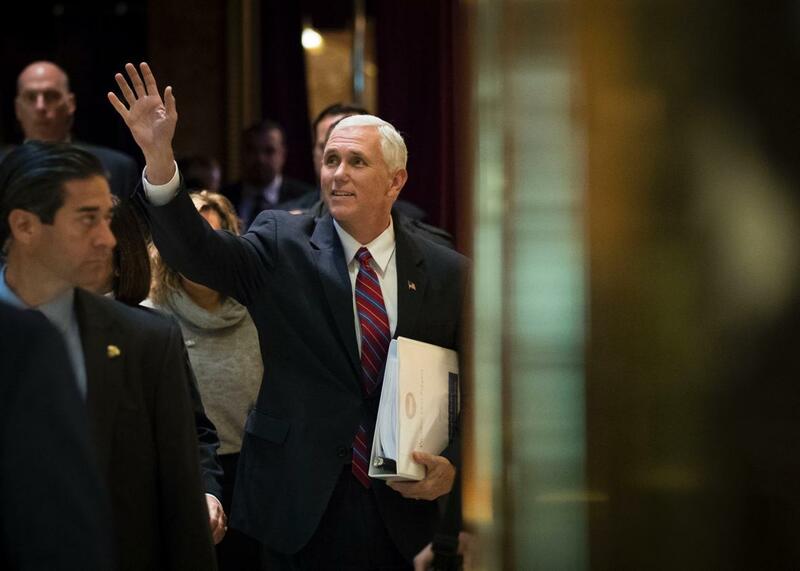 Pence was greeted by a mixture of applause and loud boos from the audience when he entered. During the performance, the always crowd-pleasing line “Immigrants—we get the job done!” got especially sustained applause, and King George’s “Do you know how hard it is to lead?” was received so thunderously, including with a partial midsong standing ovation, that according to some audience members, actor Rory O’Malley had to gesture, in character, for silence so he could continue. And at the curtain call, actor Brandon Victor Dixon, who plays Aaron Burr, read a statement prepared by Miranda, director Thomas Kail, and producer Jeffrey Seller in which the production welcomed Pence and said, “We, sir, are the diverse America who are alarmed and anxious that your new administration will not protect us,” and added, “We truly hope that this show has inspired you to uphold our American values and work on behalf of all of us.” Real talk, veep to veep. To some of us—many of us—Hamilton represents the world as we want it to be: It is barrier-shattering popular art that revisits America’s story through the acute mind of its Nuyorican creator with the kind of multiethnic cast that has historically been locked out of parts like these and is currently led by Javier Muñoz—a gay, HIV-positive cancer survivor who blows the roof off the house every night. What happens when Pence, whose anti-LGBT record as governor of Indiana was so scurrilous that it sparked a national backlash and lost his state $60 million, waltzes into our house? On a night when the cast was fundraising for Broadway Cares/Equity Fights AIDS? Yeah, he was going to get booed. He’s been booed more than once in Indiana; and in New York, we even boo politicians we like. He was also going to be politely and generously schooled by an actor speaking on behalf of several intersecting communities whose fears are genuine and deep. But to many others, this was the ineffectual Revenge of the Coastal Elites: a showdown at a show with a top ticket price that far exceeds a family of four’s two-week food budget—or, as one stern tweeter of the left put it, “a rapping civics lesson by Wesleyan grads put on for the 1%.” In the pro-Trump universe, a nice middle-American dad, who just wanted a night off before going back to being a heartbeat away from the hardest job in the world, found himself at the epicenter of blue-state rudeness being lectured by entitled showpeople with no sense of decorum. Don’t underestimate the degree to which a black man, poised and unflappably calm, speaking truth about the hopes of a nation to a white politician is exactly the kind of nightmare from which some of Trump’s voters thought they were finally awakening. Now they know that whatever they imagined might happen, this kind of thing is not going away. So, two Americas, no matter how you slice it (and you can slice it many different ways), this seemingly minor episode—can it even be called a confrontation?—was about a class divide (did it have to be theatah? ), a money divide, a policy divide, an ethnic divide, and a geographical divide. Whatever your feelings about Trump’s America, this was going to rip them open, and Trump’s tweets (my God, the years to come of looking at those two words side by side) only added fuel. But to me, the more interesting divides exposed by the Hamilton flap are those within a left that, less than two weeks after Election Day, is still staring at the smoldering crater and trying to figure out what kind of resistance can grow along its fringes. If the big divide right now among progressives is between those who feel that the Democrats should be primarily concerned with economic populism and those who believe that a coalition based on identitarian concerns can’t be left by the wayside, the intraleft split over Hamilton reflected that. There has always been a portion of the left that shares with a portion of the right a fundamental mistrust of Hollywood, of art, of pop culture. The right may think it is all degenerate—a word Trump has used about art that offends him—but the left thinks it’s all frivolous, insubstantial. An opiate for the masses, and a way of not looking at real issues. That kind of anti-elite symbol-making, in which Hamilton represents a trinket of the smugly out-of-touch (it’s great, it’s ours, you can’t get in, and you wouldn’t like it anyway), obviously freights the show with baggage it doesn’t deserve. No, it didn’t get Trump elected. But the flare-up is a bigger deal than those who are labeling it nothing more than a damaging diversion would like to believe. Little incidents can come packed with big meaning. The Hamilton episode touched on LGBTQ issues, which were shamefully underdiscussed during the campaign and remain so now. It touched on immigration; on race; on the impact and value of protest speech; on the president-elect’s temperament; on his demands for opponents to capitulate; on his disdain for First Amendment freedoms (his quartet of Hamilton tweets was consistent with his postelection attacks on public protestors and on the New York Times); and on the worries of several large populations that the Trump administration will demonize them and make them less safe. Those who consider themselves progressives—but view all discussion as a zero-sum game in which attention to one story means lack of attention to another—might do well to think harder before brushing this off as trivial because the gateway is showbiz, or because a different story is on their minds, or because they want their conversation to be the conversation. As for showbiz itself, what was exposed on Friday night at Hamilton was the dawning of the age of anxiety. Hollywood doesn’t know what to do right now; neither does Broadway. What should oppositional entertainment be in the age of Trump—especially in a country where half the population seems to instantly discredit anything that comes from New York or Los Angeles? Is the job to buck up the left, to reach out to the right, to depict an America that’s routinely ignored by Trump, to depict an America that’s routinely ignored by the makers of entertainment, or all of the above? Anger, fear, and sadness can, no doubt, inspire a lot of great creative work. But planning popular art as a sweaty reaction to electoral defeat is a surefire way to create something bad. One can embrace politically conscious pop culture and still realize that while it’s very good at some things—gradually expanding people’s vision of the world, slowly normalizing the misunderstood or marginal—it is not direct activism, no matter how performatively satisfying it can feel, no matter how viral it can go. Activism is activism; pop culture is the drip-drip-drip of water regrooving a rock so gradually that you’ll never pinpoint the moment the landscape changed. A hashtag is just the grate through which the water drips. You can do two things if you’re on a stage: Show or tell. There are those who feel Hamilton should have stuck with the first; instead, the cast and production team chose, for one night, to do both. While this is going to be a very long and ugly fight, I’d award them a narrow victory-by-decision in Culture Wars, Round One. They saw an extraordinary circumstance looming before them, they stood up, they represented themselves and others with firmness and dignity, and they sparked plenty of meaningful, nondistracting dialogue by doing so. Chances to speak truth directly to power, even when power turns its back and starts walking up the aisle, may be rarer than we would wish in the next four years. When the opportunity comes along, there’s much to be said for not throwing away your shot.